Just like us, our pet rats like to stay comfy, warm, and clean while going on with their day-to-day lives. The type of bedding you choose to line your rat’s cage with is so important, it might seem like you can just grab the first thing you see and it’ll all be the same, but that’s far from how things really are! When choosing the best bedding for rats there are a few things you’ll want to consider. Affordability: Bedding is something that needs to be changed often, especially if you have several rats cohabiting together in one space, so whichever option you choose needs to fit within your budget while also keeping in mind that you’ll have to purchase more fairly often. Odor-control: Soiled bedding can become smelly fast and as cute as pet rats might be – no one wants to be greeted by the smell of urine when they walk into a room. The bedding can truly make a huge difference with this, my rats used to stick up most of the apartment but after finding the right bedding, it only stinks after a couple of weeks. Comfort: Large amounts of dust can wreak havoc on your rat’s respiratory system and rough surfaces can irritate their feet and skin, so this comes back to the quality of a particular brand of bedding, and ensuring that it’s made to high-standards. There are a lot of odd little things like this that can possibly harm our pets that we don’t think about all the time, and it’s a shame that not every brand is safe for every rat! It might take some time to find the right bedding for your rats, but we’re here to help take some of the guesswork out. 99.5% Dust free - Less Dust, Less Mess, and Easy to clean up! If you’ve owned rats for awhile now, you’re probably familiar with how quickly their cage can go from smelling fine to being real stinky. 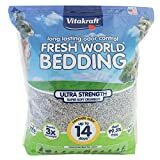 Vitakraft Fresh World bedding boasts odor control for up to 14 days, and it seems to live to this claim with most owners reporting little to no odor by the end of the second week. That’s a good target to aim for, it means you aren’t constantly cleaning your cage, and even if it does start to smell a little bit after two weeks, if you have a rough day at work or just want to put off the cleaning one more day, it’s not going to be the end of the world. It’s made from 100% unbleached recycled paper. Some bedding can contain additional chemicals or fragrances to help hide odor, but this can cause harm to your heart’s sensitive respiratory system. The reasonable price tag. For the price, you get over 2000 cubic inch of bedding, which will last you a long time depending on how many rats you have in one cage. Odor control easily lasts close to 14 days. Again, this will depend on how many rats you have in one cage. The low amount of dust in this product. Some bedding creates a lot of dust which can irritate your rat’s respiratory system. This bedding is a great size for digging and burrowing – two things your rat loves to do! It helps them feel like they’re in nature, doing natural rat things, and that’s always a plus! 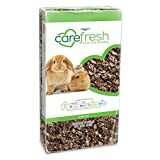 Carefresh is one of the most popular brands when it comes to small animal bedding. It’s available in an assortment of colors to personalize your rat’s cage and it boasts a similar odor control to Vitakraft, however it starts to lose its effectiveness at around 10 days. If you’ve only got a couple of rats, or you don’t mind changing them slightly more often, or you don’t mind if the smell starts to creep in a bit before two weeks – totally viable option! Otherwise, you may want to stick to another choice. In any case, this rat bedding is definitely worth trying if you want a fun, colorful look to your cage. The different colors you can choose from – white, blue, and natural just to name a few. You can also find it available in seasonal colors like Candy Corn for Halloween – white, orange, and yellow. It has excellent odor control, living up to its claim of 10 days. It’s soft – something that is especially important for hairless rats that are more sensitive and could become irritated by rough textures. It’s absorbent – your rat will stay dryer and cleaner longer than if you used a less absorbent option like fleece bedding. This affordable bedding is a great choice if you’re on a budget but still want something that is natural and performs well. It has a soft texture that is perfect for your rat’s delicate feet and expands up to 3x its size out of the bag. The reasonable price tag – like others on this list, you don’t have to spend a fortune to get a quality product. 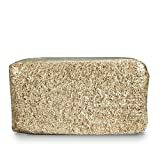 It’s made from 100% recycled paper and does a good job controlling odor. It’s another low dust option – something important to think about when it comes to rats and their tendency to develop respiratory infections. It’s soft and encourages burrowing. 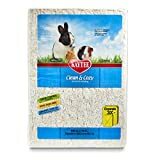 Known for making other popular small animal products like food, toys, and other accessories, Kaytee is also known for manufacturing an absorbent bedding that is perfect for rats and other small animals. It promises to absorb 6x its weight in liquid while reducing odors from your rat’s cage at the same time. It’s readily available both online and locally so you have no trouble finding it. Available in white, this bedding is the easiest to spot clean thanks to its light coloring so you can get even more bang for your buck. It is easily one of the softest and fluffiest bedding available for rats, so you can be sure that your pal stays cozy and free from irritation while in their cage. It eliminates odors well and is easy for your rat to move around if they feel the need to redecorate a bit. If you’re looking for something a bit more affordable than the standard recycled paper option, this aspen bedding from Kaytee is a great choice. For a pretty low price, you can get 8 cubic feet of bedding, more than enough for a few complete bedding changes in most rat cages. The price of higher-cost bedding can certainly add-up, even if it’s great stuff, we can’t always afford to have the very best on hand. Sometimes, we’ll buy a cheaper option and mix it in with the nicer stuff, especially if we’re using a premium bedding that has a color. The low price – it’s more budget-friendly than your traditional recycled paper options and it is very easy to find at most pet stores or online. It’s completely natural, contains no harsh additives and is environmentally friendly. It produces virtually no dust, making it a great choice for rats that are prone to respiratory infections or irritation. It doesn’t contain harmful aromatic oils (more on them below in the FAQ section!) unlike softwood varieties like cedar. Here are some things you should know about choosing safe bedding for your pet rats, and which bedding is the best to get, if you still have questions after reading through our recommendations. Can I use fleece instead of regular bedding in my rat’s cage? Yes. Many rat owners will use fleece fabric to line their rat’s cage instead of traditional bedding. This is a great way to save money, but the downside is that fleece can get stinky quickly, especially if you have several rats in one cage. To help reduce odors, many people will have multiple sets of fleece bedding in rotation, so it can be switched out while soiled pieces are being washed. You should only use unscented laundry detergent to wash your rat’s bedding, preferably something that is made for sensitive skin or infants. Can I use any wood shavings in my rat’s cage? No. Although they are readily available at most pet stores, cedar and pine wood shavings contain harmful aromatic oils that can cause irreparable damage to your rat’s respiratory system or death. Instead, the best rat bedding can have hardwoods like aspen that are also readily available but do not contain any aromatic oils. Do rats need bedding in their cage? Yes – whether you choose traditional bedding options or fleece, your rat needs something in their cage for warmth, to absorb urine and odors, and promote burrowing. Rats are known for marking their cage and having little control over their bladder, so you will need the best rat bedding which is absorbent to help remove puddles of urine from accumulating in your rat’s cage. While there isn’t a single bedding available to suit the need of every rat, there are many options to choose from so you should have no trouble finding the best bedding for rats that fits your budget while keeping your rats safe and odor-free. It can make such a huge difference once you finally find the bedding that works best for your rats, so even if it takes trying a couple of different ones, I promise it’s worth the effort!